This Lavender Soap sampler includes three 1.5 ounce slices of our handmade Lavender soaps for all the Lavender Lovers out there: Grandma's Garden, Lavender Goat Milk soap & Lavender Appalachian Crafter's Hand Repair with Shea and Cocoa Butters. All our Lavender soaps are scented using natural Lavender Essential Oil, and Grandma's Garden also includes ground lavender flowers. 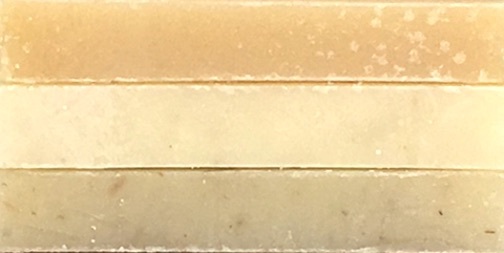 Each soap is individually wrapped and labeled so that you, or whomever will be receiving your gift, will know 'which soap is which' as you try each slice. Each slice is at least 1.5 ounces, usually 1.75 ounces, or half the size of our regular bath size bars. Soaps in this Lavender Soap Sampler will include Olive, Coconut, Castor and sustainable harvested Palm Oils, Shea Butter, Cocoa Butter, Goat Milk, Mountain Spring Water, Sodium Hydroxide (Lye), herbs and botanicals, Lavender Essential Oils.